Click here for information on the June 17, 2018, collision involving two motorcycles in Maple Valley. 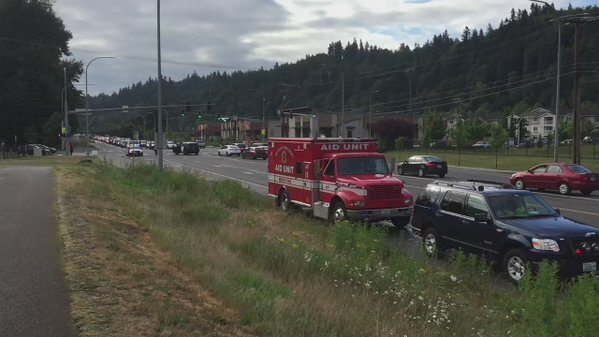 The Renton Police Department says a man in his 60s from Maple Valley was killed in a motorcycle collision with another vehicle on a busy highway during rush hour Tuesday morning. According to The Seattle Times, the motorcyclist was headed westbound on Maple Valley Highway at approximately 5 a.m. Tuesday when another vehicle heading the same direction struck the motorcycle while attempting to make a right-hand turn onto 154th Place SE. The victim, who has not been identified, was thrown from his motorcycle and struck by a passing vehicle. The second vehicle may not have been aware of the collision, as police officials told reporters that the motorcyclist was dragged more than 200 feet by the passing car. The motorcyclist was pronounced dead at the scene of the collision, and no other parties were injured as a result. Police said that both directions of Maple Valley Highway were closed for more than three hours while investigators collected evidence and processed the scene of the collision. This time is usually spent taking photographs of the scene and vehicles involved, collecting witness statements, and attempting to reconstruct the moments leading up to the crash. In order for a wrongful death claim to be brought on behalf of someone who has been killed in a collision, someone who qualifies as a beneficiary must be involved in pursuing the claim. First-tier beneficiaries might include minor children or a spouse, while second-tier beneficiaries are typically a parent/guardian, sibling, or other dependent family member. Wrongful death cases are often extremely complex and may require the assistance of a qualified attorney. Davis Law Group provides accident victims and their loved ones with a free comprehensive case analysis to determine if hiring a lawyer is in the best interests of everyone involved.